The ephemeris calculation is based upon Steve Moshier's analytical ephemeris using trigonometric expansions for the earth and planets and the lunar ephemeris ELP2000-85 of Chapront-Touzé and Chapront for the moon, both adjusted to Jet Propulsion Laboratory's DE404 (see www.moshier.net). There are further adjustments in Alcyone Ephemeris, some optional, to JPL's more recent DE406, the most accurate long-term ephemeris. Alcyone Lunar Calculator (ALC) provides detailed astronomical information on the Moon. It calculates accurate geocentric or topocentric positional and physical ephemerides, times and circumstances of lunar events (e.g. lunar phases, perigee, apogee, passages through the nodes, first and last lunar visibility, occultations, eclipses), orbital parameters and more covering the time period AD 1200 to AD 2100. Lunar topographic information are available by use of a high-resolution interactive image map based on images taken by NASA's Lunar Reconnaissance Orbiter Camera (LROC). In addition ALC offers graphical capabilities for data visualization in different kinds of printable and exportable 2D- and 3D-diagrams and projections (e.g. 3D-orbit diagram, libration diagram, visibility diagram, elevation maps). The ephemeris calculation is based upon Steve Moshier's analytical ephemeris using trigonometric expansions for the earth and planets and the lunar ephemeris ELP2000-85 of Chapront-Touzé and Chapront for the moon, both adjusted to Jet Propulsion Laboratory's DE404 (see www.moshier.net). 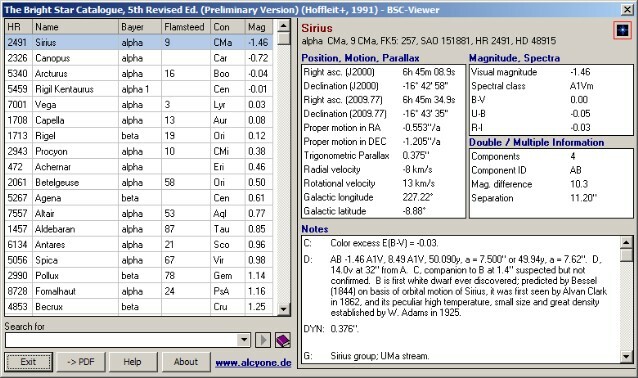 Alcyone Astronomical Tables 3.0 is a collection of astronomical data in electronic form. It provides detailed information on various astronomical phenomena (conjunctions with the Sun, planetary conjunctions, oppositions, stations, greatest eleongations, lunar phases, equinoxes and solstices, passages of aphelia and perihelia (apogee and perigee), transits, solar and lunar eclipses (including local circumstances) covering the period 3000 BC (2000 BC) to AD 3000. Alcyone Astrononomical Tables offers additional functionality as printing, chart generation, data export (Excel, HTML, ASCII, CSV), searching for specific values, and time range specification. The calculation (except eclipses) is based upon Steve Moshier's analytical ephemeris using trigonometric expansions for the earth and planets and the lunar ephemeris ELP2000-85 of Chapront-Touzé and Chapront for the moon, both adjusted to Jet Propulsion Laboratory's DE404 (see www.moshier.net). All eclipse predictions were performed by Fred Espenak and Jean Meeus (NASA's GSFC). As data are pre-calculated and saved in a database, all calculations are very fast. 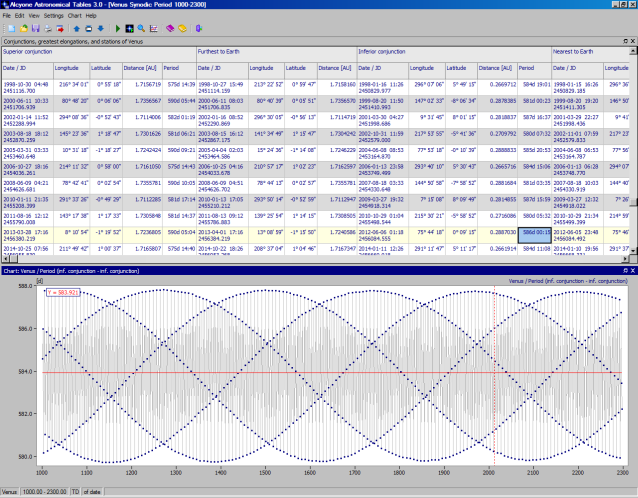 Alcyone Astrononomical Tables can be used as a 'stand-alone program' and/or as an addition to Alcyone Ephemeris. 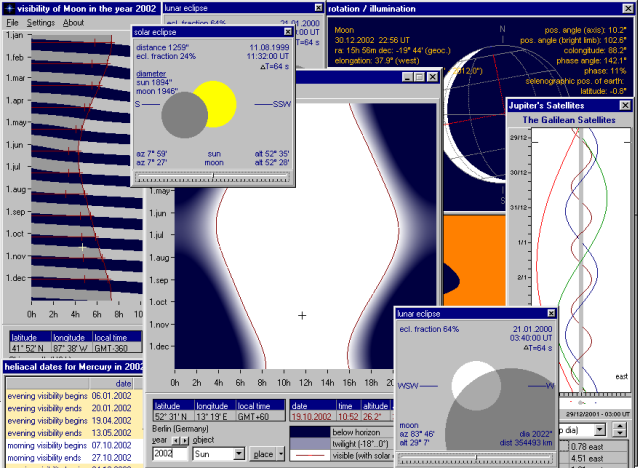 Alcyone Eclipse Calculator (AEC) calculates the local circumstances of all solar and lunar eclipses that occur(ed) in the time range between -1999 (2000 B.C) and AD 3000. The local circumstances are presented as eclipse maps and tables for a list of locations (see screenshots). Locations can be selected from an extendable location database with more than 2000 entries. In addition reports of local circumstances of successive solar or lunar eclipses at a specified location can be generated (see example). Exporting maps for import into graphics applications is available as well as printing maps and tables (see example). Different world maps and maps of all continents are included. For the calculation of "historical" eclipses nine different formulas for the determination of DT (TD-UT) are provided. 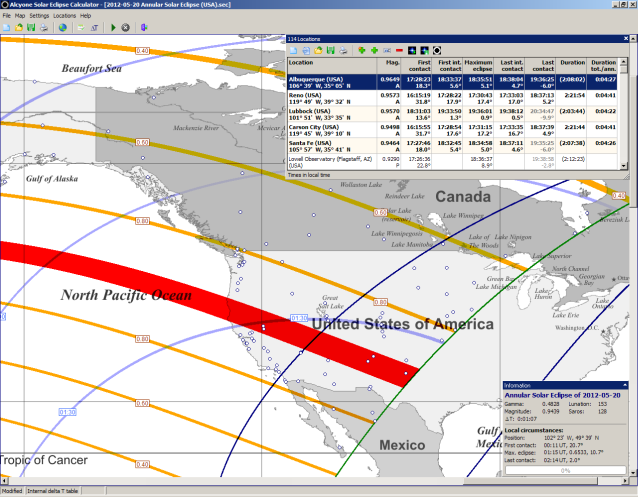 Alcyone Solar Eclipse Calculator can be used as a 'stand-alone application' or as an addition to Alcyone Ephemeris. The calculation of the local circumstances of solar eclipses is based upon the data from the Five Millenium Canon of Solar Eclipses -1999 to 3000 (Fred Espenak, NASA's GSFC) with Besselian Elements provided by Jean Meuus. The calculation of the local circumstances of lunar eclipses is based upon the data from the Five Millenium Canon of Lunar Eclipses -1999 to 3000 (Fred Espenak, NASA's GSFC). Planetary, Lunar, and Stellar Visibility (successor to Planet's Visibility 2.0) presents a 3-color diagram that shows when a planet, a star, the moon or the sun is visible during any year from 3000 BC to AD 6000 at any location on the earth. The vertical axis marks the months of the year, the horizontal axis marks the hours of the day. The three colors create a contour map effect and show whether the body is under the horizon (black) and invisible, above the horizon with the sun (light color) and invisible, above the horizon without the sun (shaded color) and so possibly visible. The times of sunrise and sunset and when the sun reaches specified altitudes above or below the horizon can be shown as curves on the diagrams. By moving the mouse over the diagram, the date and time along with the object's altitude, azimuth, and magnitude, or the phase of the moon, are displayed. In addition, Planetary, Lunar, and Stellar Visibility computes and tabulates the dates of visibility phenomena: for planets and stars first and last visibility, acronychal rising and cosmical setting; for the moon first and last visibility, and the tables provide much supplementary information. These phenomena are very useful for historical purposes. Since the computation of visibility phenomena is complex and uncertain, alternate methods are provided and parameters can be altered by the user to find what appear to be the best results. There are also diagrams of solar and lunar eclipses, of the rotation, inclination, illumination, and apparent size of the bodies, and of Jupiter's satellites. 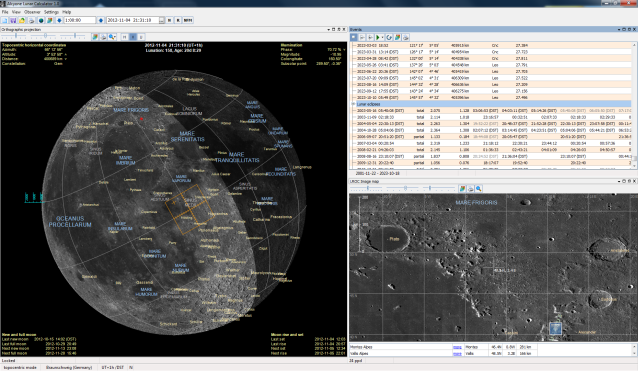 The settings for the computations may be saved, the graphics may be saved, pasted into documents, and printed, and the tables for visibility phenomena may be accumulated, edited, printed, and saved as .rtf files or HTML files to be pasted into documents and printed.Full documentation is provided.Planetary, Lunar, and Stellar Visibility is freeware and runs under Windows 98, ME, 2000, XP, and Vista. The Bright Star Catalogue contains 9110 entries of all stars brighter than magnitude 6.5 (the naked eye visible stars). It's one of the most widely used star catalogues and provides detailed basic astronomical and astrophysical data. The Bright Star Catalogue Viewer displays the data of the 5th Revised Ed. (Preliminary Version) (Hoffleit+, 1991, Yale University Observatory) as distributed by the Astronomical Data Center at NASA Goddard Space Flight Center. For more information on the Bright Stars Catalogue see here. The Bright Star Catalogue Viewer offers different searching options (e.g. search for common star names, Bayer or Flamsteed designation, HR, HD, SAO number and more), data sorting, star chart generation, and PDF reports (examples: Sirius, Betelgeuse, Becrux). 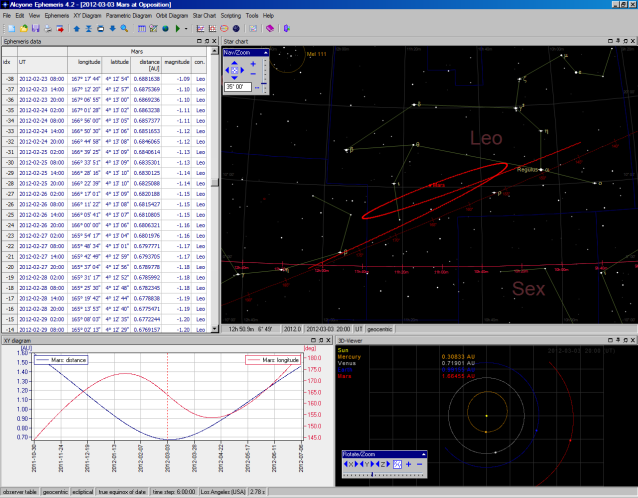 The Bright Star Catalogue Viewer is shareware and runs under Windows ME/2000/XP/Vista.